Last month we posted a piece on the diversity of tactics being used in Grand Rapids to resist the US war in Vietnam. Some of that resistance came from Calvin College, with both students and faculty being involved in the opposition to the war. We just uploaded the complete coverage from the Calvin student newspaper of all their articles on opposition to the Vietnam war, resistance that began to be reported on in 1967 and lasted until 1973. The evolution of the reporting is interesting, but tends to reflect the national movement’s opposition timeline, with many people not getting involved until 1967 and most of the opposition dying off after 1973, even though the US occupation of Vietnam continued until 1975. Some of the articles dealt with the ongoing debate around US involvement in the Vietnam war, with articles on debates pages 4, 26 and 30. There is also an interesting article (page 11), which was responding to a pro-war diatribe appearing in the Christian Reform Church’s national publication, The Banner. 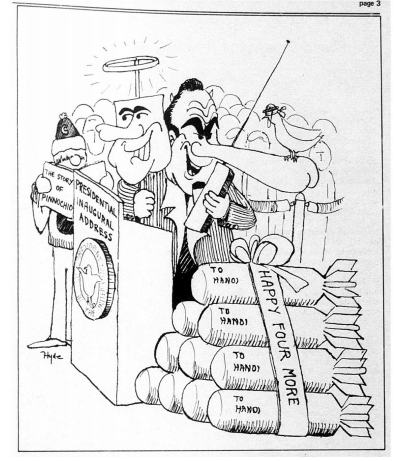 The Banner article referred to any anti-war position as “treasonable propaganda” and thought the US role in Vietnam was akin to a holy crusade against any “Christless” ideology around the world. Not surprising the Calvin student newspaper published several articles over the years looking at Christian responses to the war, with an interesting piece (page 27) about both Phil and Dan Berrigan, the brothers who were involved in the Catonsville 9 protest, where they broke into a government office and stole draft files and burn them in public using homemade napalm. 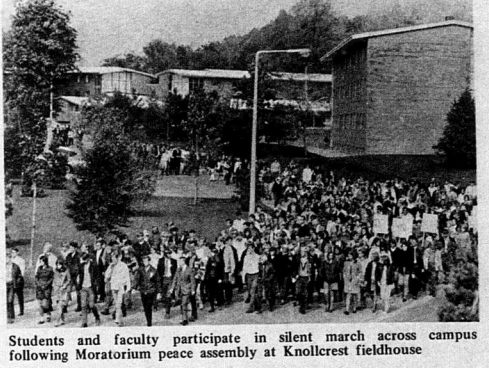 However, most of the articles in the student newspaper dealt with organizing efforts on campus with both students and faculty members who opposed the war. Some of these articles dealt with the opposition to the draft, how to be a conscientious objector, a student run anti-war information service, forums, rallies and Calvin student involvement in national marches in Washington and Chicago in 1967, 1969 and 1971. There was also some reporting on the anti-war organizing happening off campus throughout Grand Rapids, with a piece about Julian Bond speaking at Aquinas College (page 21), Jane Fonda and Tom Hayden at Fountain St. Church (page 34) and an article about the Kent County Peace Council (page 35). 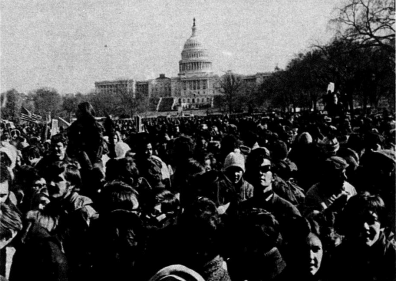 As someone who was connected to the antiwar movement opposing the US occupation of Iraq, the level of anti-war activity seems to be more diverse and involved many more students and faculty during the Vietnam. This was most likely due to the impact of the Draft, which forced more men to come to terms with the morality of the war in Vietnam, but it is also a reflection of the larger counter-cultural dynamic that existed around the country in the late 1960s and early 1970s. This entry was posted in Vietnam War Resistance and tagged anti-Vietnam War reporting at Calvin student newspaper, anti-Vietnam war resistance in Grand Rapids, pro-war diatribe in The Banner. Bookmark the permalink.